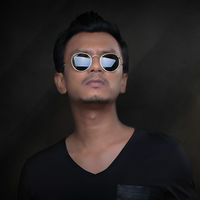 Faizal Tahir is a singer-songwriter-producer who has one of the biggest followings in Malaysia. He is also the founder and owner of Faithful Music with Hanie Soraya, Elizabeth Tan and Aziz Harun being the labels current artists. Faizal Tahir is very influential with his very own style and music. His main and ultimate goal is to always deliver fresh and new sounding music to the Malaysian market. His debut solo album ‘Aku.Muzik.Kamu’ started off very well and straight away earned him many awards in various prestigious award ceremonies including Anugerah ERA, Anugerah Planet Muzik, Anugerah Industri Muzik, Anugerah Juara Lagu, and many more. Among them, Best Vocal, Best New Singer, Best Rock Album and Best Album. He has since recorded 3 studio albums with countless hit songs and chart-toppers and raked up numerous awards to date thus making him one of the most successful local artistes to date. Currently, Faizal is keeping himself busy by spending more time writing songs and producing for other singers and his own special projects before starting to write new material for his fourth studio album. Faizal released his latest single ‘Assalamualaikum’ in November 2014 and the song has made it to top 10 on all top radio charts in Malaysia.